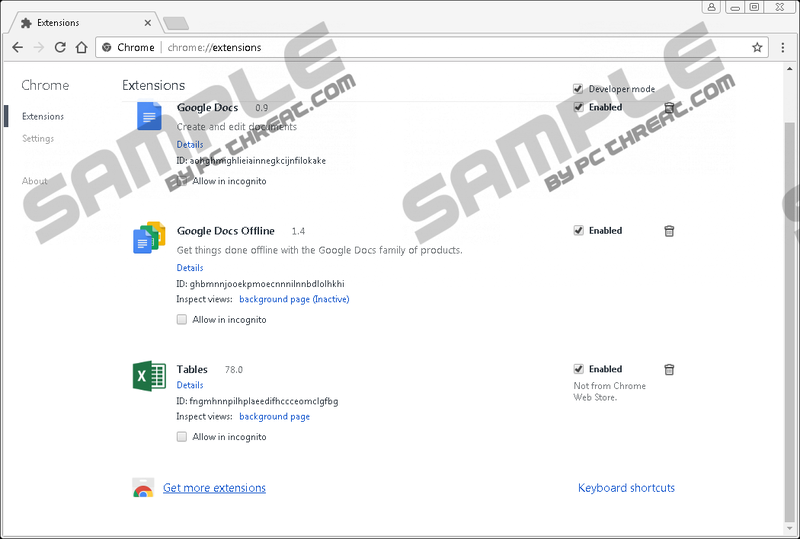 If you have noticed an increasing number of third-party advertisements and redirections to questionable pages while going online, it is possible that a malicious browser extension called Tables has managed to sneak onto your system. This risky application can appear on your system without your knowledge and disguise itself as a legitimate extension. Due to its capabilities, we have classified it as an adware program. This infection can expose you to a flow of potentially unreliable third-party advertisements and websites, which can drop further malware threats onto your machine or you could also be scammed if you engage with the content coming from this adware. Since this malware infection can enter your computer along with other malicious software installers, it is not enough for you to simply remove Tables if you want to use a clean and safe PC. Please read on for more information on this useless adware and how you can defend your system. When it comes to malware infections, one of the most important things to know about them is how they are spread on the web so that you have a chance to avoid the next attack. This browser extension does not even have its own promotional page and cannot be found in the Chrome web store either. If there is no official way for you to download an application, it should raise the red flag right away making you want to delete Tables or any other similar application ASAP. Even more so when you learn that this extension may be found in freeware bundles packed with malicious threats as well as potentially unwanted programs. As a matter of fact, most computer users infect their PC by dropping such bundles. You can download such a malicious package in a number of ways. For example, you want to download a new free application and you search the web to find a page where you can download it. However, you land on a fake file-sharing website operated by crooks and when you click for download, you drop a bundle of threats instead of a standalone file or installer. It is also possible that you get redirected to questionable websites after clicking on an unsafe link or ad, including gaming, dating, torrent, and freeware pages, and these present to you corrupt third-party ads. Clicking on advertisements is practically never safe because chances are you end up being scammed by cyber criminals on a malicious or fake website. This is even more possible when your computer is infected with malware that can display third-party content, such as advertisements, fake buttons, and fake notifications, while you are browsing the web. There is one more important thing to know about bundles in general: You may be able to deselect the contents you do not want to see on your system. It is possible that the installer reveals its true content on the first panel of the installation wizard but this may only be disclosed in the license agreement which is ignored by most users. In any case, if you think that this adware could be on board, we recommend that after you delete Tables, you run a malware scanner to detect all other possibly harmful programs as well. For best results use a reliable and reputable online malware scanner to make sure that you do not fall for a rogue security tool of which there are plenty. This is a rather tricky adware infection because it pretends to be a legitimate browser extension. If you check the extension list in your Google Chrome browser, for instance, you will see that it displays "fngmhnnpilhplaeedifhccceomclgfbg" as its unique Chrome ID; however, this ID officially belongs to an authentic application called EditThisCookie (chrome.google.com/webstore/detail/editthiscookie/fngmhnnpilhplaeedifhccceomclgfbg). This is why you need to be careful when you are ready to remove Tables from your browsers since you might mix it up with the legit app. The presence of this adware is quite obvious because your browsing experience may turn into hell when presented with potentially harmful third-party ads this extension keeps showing you on your screen. We have found that this infection connects to the "go.oclasrv.com/afu.php?zoneid=" ad server and may also redirect you to malicious pages. As you may know it is always risky to engage with third-party advertisements when their reliability is not warranted by the creator of the particular website where you see it or the authors of an application. This means that cyber criminals may also get their own share of promotion through such sites and apps. One click could drop further malware threats onto your system in no time but you may also be redirected to fake websites where crooks are looking forward to scamming you so that you would reveal your personal and banking details. We believe that it is quite obvious what might happen if you fall for such tricks. So, if you do not want to experience any of such awful scenarios, we suggest that you remove Tables as soon as possible. Our research indicates that this adware affects your Mozilla Firefox and Google Chrome browsers only. Therefore, you need to remove Tables extension from both if you want to eliminate this threat source. Make sure that you do not delete any legitimate extension accidentally. You can use our instructions below if you are not familiar with the necessary steps. Remember that this will not clean your entire system where further threats may be lurking as you are reading these lines. You can try to hunt down all the potentially risky applications manually but if you are looking for an effective and automated way, we advise you to install a powerful anti-malware program like SpyHunter. For the best defense possible, we also recommend that you keep all your programs and drivers updated on a regular base. Press Alt+F and from the menu, choose Settings. Click on Extensions in the left panel. Select the unwanted extension called Tables and click on the trash can. Press Alt+T and from the menu, select Add-ons. Click on the unwanted extension and press the Remove button. If need be, restart your browser. Quick & tested solution for Tables removal.